Today, December 10th 2018, marks seventy (70) years since the United Nations General Assembly adopted the Universal Declaration of Human Rights in 1948. 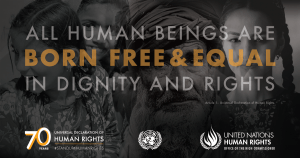 Article 1 of the UDHR states that “All human beings are born free and equal in dignity and rights”. It is a declaration that speaks volumes about the inalienable, indisputable and universal nature of human rights for all. It is in recognition of the fact that all of us are to be treated with dignity. Unfortunately, in some parts of the world, some human beings continue to be deprived of their human rights. Majority of African lesbian, gay, bisexual, transgender, intersex, and gender diverse people continue to be treated with indignity and often subjected to inhumane treatment. Transgender and gender diverse people continually face this inhumanity at elevated levels. This is often because society tends to associate gender diversity and atypical gender expression with homosexuality – which is considered detestable. Furthermore, incriminating laws and alienating policies continue to fuel this hatred and irrational fear of all people with diverse genders, sexualities and expressions. This year has been tough on trans and gender diverse East Africans. Tanzanian trans communities have been driven deeper into the catacombs of society as a measure of survival. 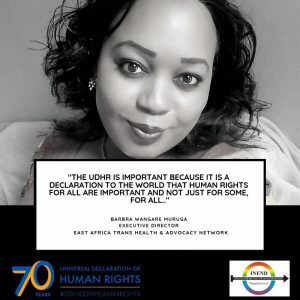 Furthermore, some trans people have had to run away from the country for fears of violence due to the statements made by Tanzanian politicians. Kenya has become a safe haven for East African trans migrants and refugees from Uganda, Tanzania and other neighbouring countries. Still, the environment is not as friendly as imagined. Yet for these migrants, this environment is far more tolerable than where they come from. It is imperative therefore, that our governments uphold the UDHR; the rights enshrined in the declaration and those enshrined in our constitutions. Targeting human beings simply because they deviate from socially acceptable gender and sexual norms is not acceptable. We insist on our governments to protect our communities on this basis; to uphold our human rights and to ensure that we live our lives free from stigma and discrimination.